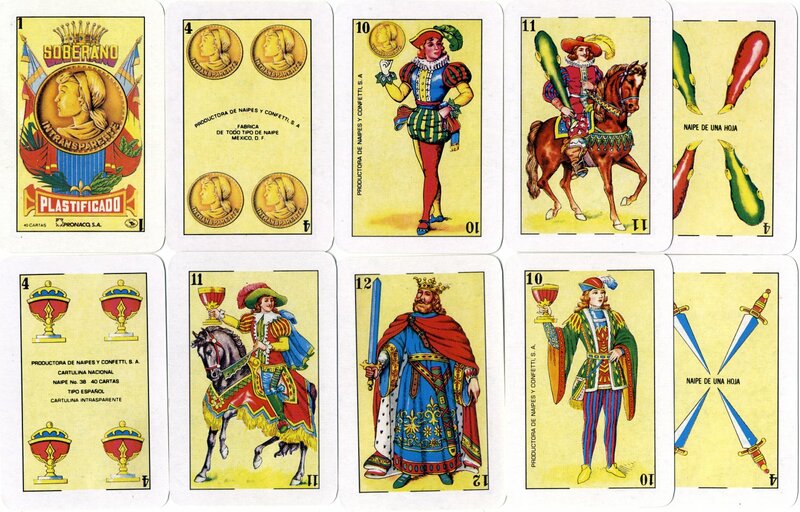 Based closely on Naipes Gallo by Clemente Jacques, which have become almost a standard pattern in Mexican playing cards, which in turn are inspired by Fournier's Castilian pattern designed by Augusto Rius in the 1880s. 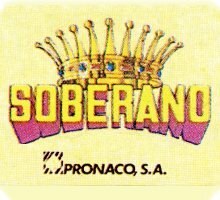 Pronaco also produce similar packs with the brand names Centenario, Emperador and Imperial, as well as tarot packs. Above: Naipes Soberano published by Productora de Naipes y Confetti, S.A., Mexico, c1990s. 40 cards, plastic coated. The publisher's name appears on the four Jacks (or Sotas) and on the Four and Ace of Coins. More recent editions of this pack appear to have been printed in China.